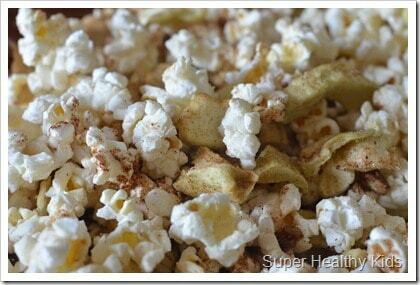 Popcorn is surprisingly a healthy snack for kids! It’s in fact 100% whole grain. It’s high in antioxidants, high in fiber, and still low in calories. Consequently, we’ve been eating a lot of it, and so we decided to try different toppings and seasonings. Of course this one is a keeper! 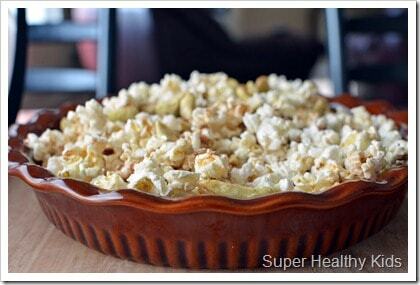 We call it Apple Pie Popcorn, and we usually serve it in round dish. In small bowl, mix together spices and sugar. Combine popcorn, dried apples, and pecans. Dump sugar-spices over popcorn mix, and shake to coat. This delicious snack will arguably become a number one favorite on your kids’ list of healthy snacks soon enough! It is easy, fast and fun, and for this reason will be requested over and over so try it tonight! LOVE popcorn! I’m usually a purist when it comes to popcorn and just a little butter and salt is perfect for me, but, when I want something a little different, some freshly grated Parmesan on top gives it a great flavor hit. A little goes a long way too. Good idea to go with a machine if you like to make a lot of popcorn. It’s the healthiest way to go. Your recipe sounds really delicious. How unique and delicious this looks. I have been trying to eat healthier and provide my family with healthier options and found this healthy way to prepare chips and oh how I love chips. I add herbs and some sea salt and they are tasty. I have gone through your whole site. Tremendous recipes are presented which I love to make at home. Thank you so much for sharing such nice recipes here. Love to add whey protein isolate to my morning breakfast. wow, sounds so yummy! i love our popper and popcorn is a snack we all enjoy in our house too!!! Maybe I’ll have to invest in a popper. I do the microwave paper bag thing, but the yield isn’t great! We end up re-popping after the first round since there are so many unpopped kernels. This really sounds delicious! It is filled with such healthy ingredients! What popcorn popper do you use? I use a regular air popper just from the drug store!